The English Speaking Union (ESU) is a non-profit organization formed in 1918 to help preserve the global communications forged during World War I. The organization is now devoted to fostering peace and idea exchange worldwide using the English language as a catalyst. Dr. Peeper first became acquainted with the ESU during medical school in New York. On arrival to New Orleans in 1994, he joined the ESU. As a board member he started the local Shakespeare Competition. He was New Orleans president for 11 years. He has also served on the ESU National Board for many years and has served as National President since 2004. He has served as a delegate at ESU International Council Meetings in Kyoto, Genoa, Istanbul and London. Mr. Harold joined the English Speaking Union in 2002 and has served on the local board of the New Orleans branch for 14 years. He has assisted with the annual Shakespeare competition and the BUS scholarship which sends a local teacher to Great Britain for studies in English, Shakespeare and the theatrical arts. 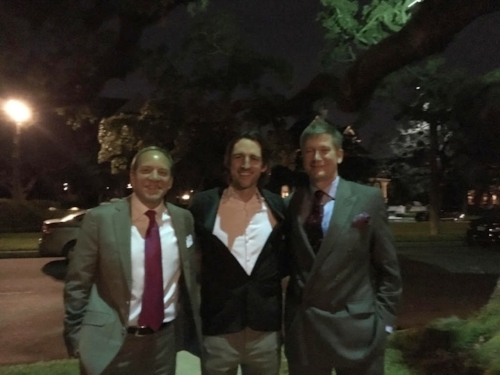 ere is a recent photo of Quinn and Michael with Nick Ashley Cooper during his visit to New Orleans following his lecture.